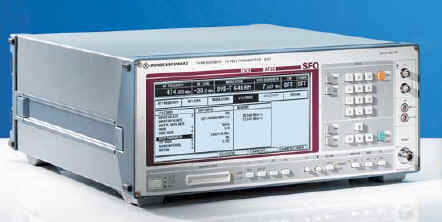 Rohde Schwarz SFQ (8VSB) : Video Generators - Test Equipment Connection - Prüfgeräte zu verkaufen - verpachten - vermieten. The R&S SFQ TV Test Transmitter offers a solution for testing digital TV links and receivers (set top boxes). An open end software system and modular hardware configuration make the SFW future proof. The ETSI standars for DVB-T, DVB-S, DVB-DSNG and DVB-C as well as ATSC/8VSB and ITU-T/J.83B (US cable) standard for DTV are full complied with. In addition to digital signal processing, the Rohde & Schwarz SFQ also processes analog frequency modulated satellite signals in line with PAL, SECAM and NTSC standards. The sound signals are transmitted using analog FM and digital ADR sound subcarriers.